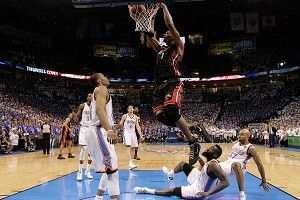 With one minute left to play in Game 2 against the Oklahoma City Thunder, the Miami Heat led by five points. They had possession of the basketball, seeking to score a game-clinching basket. 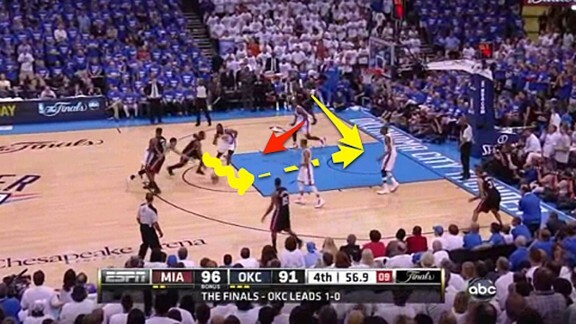 They set up a Dwyane Wade–LeBron James pick-and-roll, but they added a twist to open up a lane for Wade. 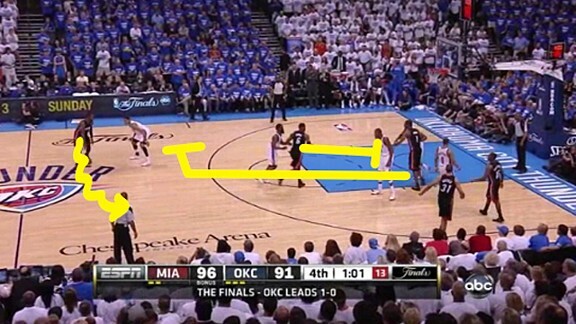 After the Heat beat the the Thunder’s trap, Wade has the ball with 14 seconds left on the shot clock. Once Wade receives the basketball up top, James sets a pin-down screen for Chris Bosh. 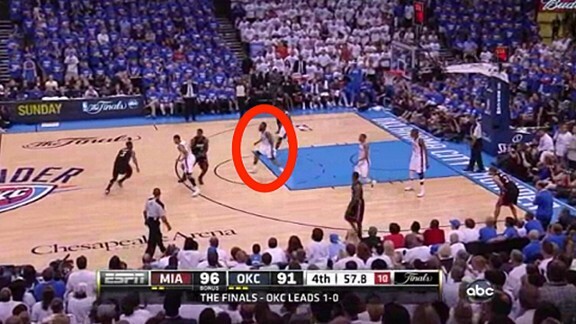 Bosh comes off that screen and runs up as if he is going to set a screen for Wade. But Bosh doesn’t set the screen. 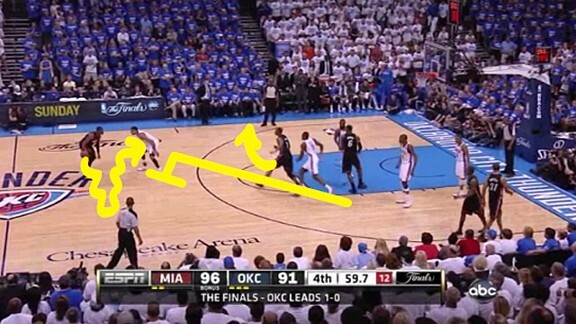 He shows toward Wade, but quickly changes direction and heads toward the short corner. As Bosh clears out, James immediately turns around and sets a ball screen for Wade. However, instead of setting it on Wade’s right, James comes to the opposite side and screens his left (Miami ran this set on the previous possession, so the left-side screen is a slight counter). After taking a dribble to the right, Wade crosses over and uses James’s screen. Bosh’s fake screen means that James’s man, James Harden, isn’t expecting him to shoot up, so Harden can’t properly defend the screen. He gets caught watching the play at the free throw line, too far away to have an impact. Wade gets the space he needs to split the two defenders as he comes off the screen. 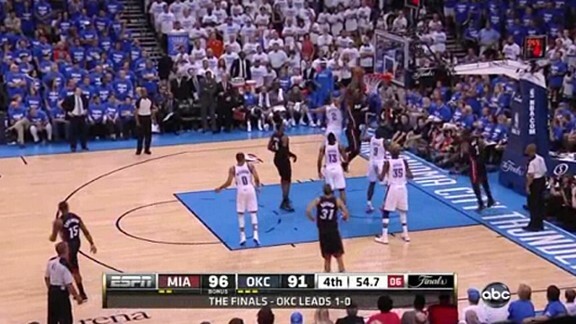 Serge Ibaka has to come over to help, leaving a cutting Bosh open at the front of the rim. This set highlights how much the Heat missed Bosh while he was injured. Bosh is a legitimate pick-and-roll threat who commands defensive attention, making Miami dangerous at the end of close games. With many options, they can easily get the defense out of position.